A few nights ago Mark and I were craving something sweet and savory. We had recently heard a rumor that Portland has a Bar of Chocolate, yes that would be a bar dedicated to all things chocolate! Immediately we knew we had to check it out. Little did we know that this little Wharf Street gem would not only have a case full of amazing homemade desserts, but they also have Absinthe. For those of you who are unfamiliar with the much-loved, made famous in France, neon green liqueur let me tell you–it’s not for the faint of heart! I have had it numerous times, and the overwhelming flavor of anise (black licorice) makes me despise it every single time. Mark, on the other hand, loves it. 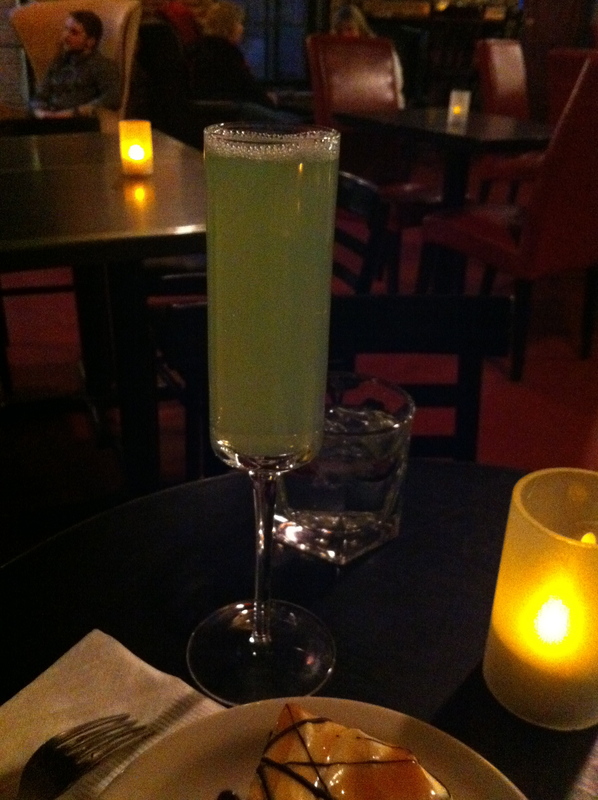 Since he hadn’t had it in a while he decided he had to have one of the bar’s unique concoctions, which is aptly named ‘Death in the Afternoon.’ So, at our candlelit table Mark proceeded to have a drink that would make anyone buzzed after a single serving: Champagne mixed in equal parts with Absinthe. A true, liqueur’s quicker glass. I decided on something sensible to go with my dessert–an Argentinean Malbec. So, while Mark happily swilled down his beloved green poison, I sipped my wine. Then, our cake was delivered! 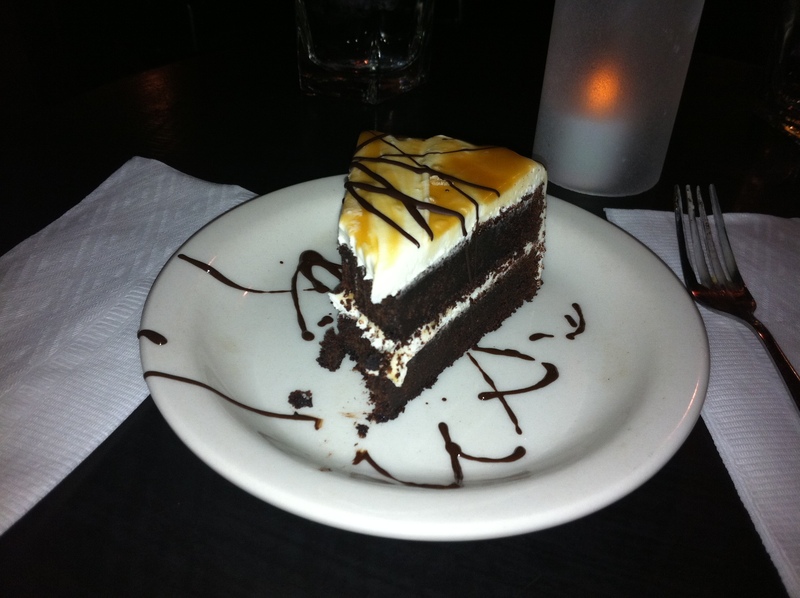 We decided to go with the salted caramel cake since we had come in craving something sweet and savory. While the cake itself is a bit dry for my taste, the icing and the salted caramel on top clearly makes up for any moistness that the cake is lacking. It’s simply amazing. I find myself craving it once a week…so between there and Red’s Dairy I will weigh 1000 pound by Labor Day. So, stop in The Bar of Chocolate, by Cinque Terre on Wharf street. It’s great for pre-or-post-dinner drinks and/or dessert! Tonight my husband and I will be hosting a party for our very adorable and dear friends, Ben and Laura. I decided it would be best to stick with my seafood theme as of late and I will be making crab cakes later. But first thing this morning, in between editing and writing some copy for work I had to whip together some brownie cupcakes for dessert! I decided our two cute friends needed a little chocolate after party tonight! Preheat oven to 325ºF. Throw all the ingredients in a bowl and mix these little puppies up! Line your cupcake pan, fill 3/4 of the way and bake for 29 minutes. When they are done cool on a cooling rack for a few hours! 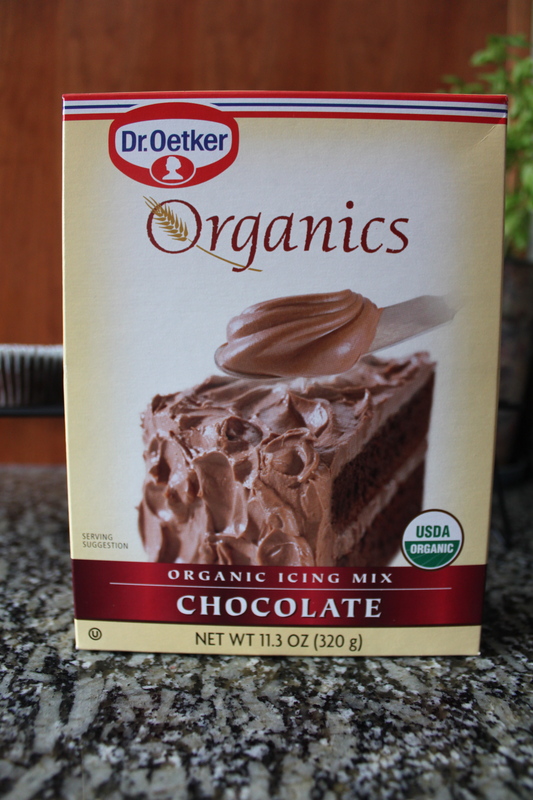 Now it’s time for Dr. Oetker to do his thing! 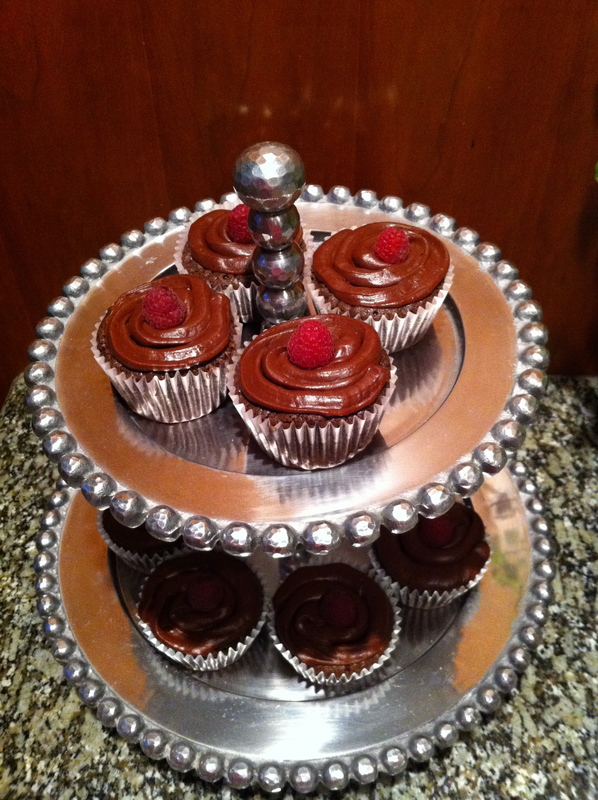 Get this, follow the directions, and the put it on top of the glorious brownie cupcakes! The icing on the cupcakes! You slaved and slaved right? SHUUSHHH don’t tell anyone it’s boxed!! Now put that glorious icing in a ziplock, move it all down to one corner. Cut that corner and began swirling the icing onto the brownie cupcake! Garnish with a raspberry or strawberry or whatever kind of berry you have. Are you as hungry as I am for this oh my gosh I can’t wait until dinner is over! P.S. These are so good, and such a huge hit! Ben and Laura had to take some for the road (they begged me for the recipe)! So, Ben and Laura HERE IT IS!